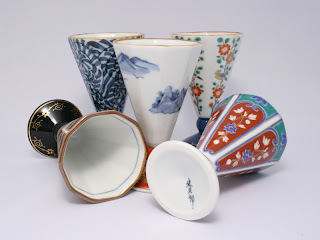 Sake wares has many different kinds. It is cool if you use different sake wares for different occassions. Choko is the most popular cup for sake. uses; all temperature of sake. There are many collectors who are buying very expensive ones. My dad bought over $200.00 of choko in Kyoto. It was not a bad price. I saw many of over $500.00 choko at Yahoo Japan Shop. Guinomi is a large type of choko. But, I think sometimes it is too hot to drink if you use it for hot sake. You might consider sake temperature. Sakazuki has many different kinds. I saw solid gold sakazuki! Sakazuki has a long history. You know the Japanese Mafia. They also use a sakazuki for the ceremony of making friendly cooperative relations. In the ceremony they use only one sakazuki to drink sake. It is the evidence of the promise. Gou is a Japanese unit. It is also used for ceremonies. Some masu has the mark of the sake maker. Some people put salt on the corner. They enjoy sake with salt. How many kinds did you know? Brim over I to but I think the collection should have more info then it has.